Enjoyed the ride on the net. Very interesting. Thanks for the e-mail. I just received a number of e-mails from 2003, due to computer glitch or my non-tech life. Thanks for stopping by, Billy. It's an honor. Courtesy of Wayne McCombs and Joe Riddle, here is the opening of the Billy Parker Big Rigger Show on KVOO in 1973. 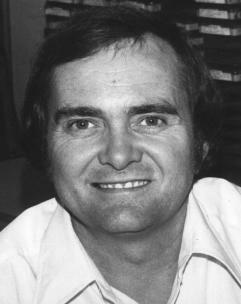 Says Wayne: "Starting in 1972, Billy Parker worked 12 midnight - 5 a.m. on KVOO-AM with country music and requests. At night KVOO's coverage was from the Canadian border into Mexico and from the Rocky Mountains to just east of Claremore. 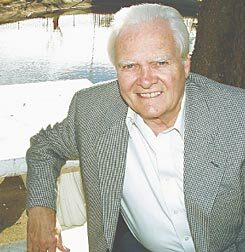 Parker pulled in 60-70% of all Tulsa radio listeners during his time on the air." Check out Billy's web page at the Bill Haynes company site. Billy has been a local TV spokesman for Haynes over 20 years. In addition to his daily KVOO show, he did a weekly show, "Wooley Wednesday" (later retitled "Swingin' Country" when it changed timeslots), about the history of Western Swing with Tulsa World writer John Wooley on KVOO-AM. I really enjoyed Billy's tribute to Bob Wills, "Swingin' with Bob". I picked it up at Lee's Records, over in west Tulsa. There was an autographed Gailard Sartain picture on the wall there, too! Billy's CD, "Billy Parker and Friends", is available at Amazon.com. On it, Billy sings solo songs and duets with Webb Pierce, Cal Smith, Ernest Tubb, Darrell McCall, Bill Carlisle, Johnnie Lee Wills, Jack Greene and Jimmy Payne. Erick Church tells us that Billy Parker now hosts a show, "Big Country with Billy", Saturdays at 8-10 am on Big Country 99.5. Billy also hosts "Sunday Evening At The Memories" on 8 - 10 pm Sunday (of course) on KVOO-FM 98.5. Billy can be emailed from the bottom of either linked page. KWGS' Casey Morgan: "For those of you who miss the Billy Parker / John Wooley western swing show formerly on KVOO, you should know that John is doing the show alone on KWGS now. It's called "Swing On This" and it airs Saturday nights from 7 to 8 on 89.5 fm." It is an excellent show. John's web site carries the song list each week. Billy Parker sits in the front yard of his Broken Arrow home. Some folks remember his radio shows, while others grew up watching him sell siding and windows on Saturday afternoons. Some folks know his voice while others his face; but not too many people know that Billy Parker lives in Broken Arrow. "I guess it all started with a guitar," the friendly country gentleman likes to say. Parker, a native Oklahoman, has been a friend to country music ever since he first picked up a Stella guitar his momma bought him when he was just 11. 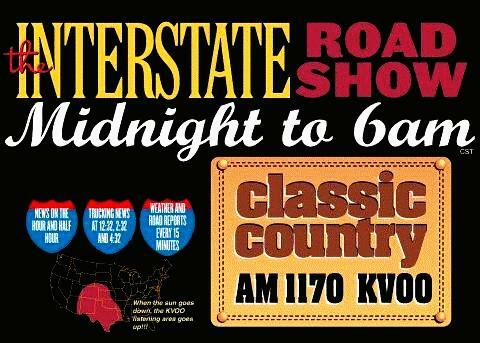 Today, Parker hosts the Still Swingin' western swing show Saturdays and Sundays for KVOO, 1170 AM. In between, he's done just about everything. Parker was born in Tuskegee, Okla., and grew up in Tulsa, where his father worked for Douglas Aircraft. At 14, he moved to McAlester and started playing guitar on the radio after school. "I was a bad guitar player, too, but I guess they thought I was the only one in town," Parker said. Soon thereafter, Parker moved back to Tulsa where he began working at QuikTrip. One day in 1959, while listening to KFMJ country radio, Parker heard the station announce they were looking for a part-time disc jockey. Parker drove directly to the KFMJ offices and applied for the job, and was hired to play gospel music on the weekends. "I more or less liked the business from the beginning," Parker said. "I used to listen to the Grand Ole Opry and just loved country music, period." Soon after being hired, one of the station's full-time DJ's was fired and Parker took his spot. As a full-time jock, Parker drove to a small neighboring town where he did a show called "The Broken Arrow Hour." "That's what drove me into the business," he said. For The Broken Arrow Hour, Parker sold 10 ads to Broken Arrow businesses at $10 apiece. For the show, Parker made a 10 percent commission, earning himself $10. "I was lucky to find 10 sponsors who had 10 bucks," he said. One of his sponsors was Jack Ross, who at the time ran Ross Drugs. "I felt like Broken Arrow was my home," Parker said. Parker worked at KFMJ until 1968, when he joined the Grand Ole Opry, and Ernest Tubb and His Texas Troubadours. Parker had put out an album in 1959, a song from which Tubb covered, and that's how Parker hooked up with Tubb. While on tour with the Troubadours, he saw the ins and outs of the music business and got to work with some of the most important names in country music, including Bob Wills and Red Foley. However, Parker soon grew tired of touring and being away from his 1-year-old son, and in 1970 moved back to Tulsa. "I've had millions of dollars worth of experience," Parker said. "I haven't made millions of dollars at all but I've had so many experiences I wouldn't take a million dollars for." Parker said, with a few exceptions, modern country music all sounds the same. "Back in those days, they identified the artist not only with the song but with the voice," Parker said. "Today, you can ask somebody who's singing that song and they can't tell you. In a lot of cases, they're putting too much rock or rockabilly into it and calling it country. "That's just my opinion but from a lot of folks I've talked to, that's their opinion, too." But regardless of his take on modern country, Parker acknowledges the need for artists to change. "There's an old Bob Wills song called 'Time Changes Everything,'" he said. "You'd better be ready to change with it or go ahead and get out of the picture. I'm for success. You've got to go get it, you've got to be on the road, you've got to be working the concerts." Upon his return to Tulsa, Parker began DJing for KVOO, doing "The All Night Show." "I used to play new artists, artists who couldn't get play a lot of places and KVOO gave me that opportunity," he said. "I played local artists all that I possibly could and tried to help them. "If it got to the point where I couldn't do that, I would probably no longer care about the business." Parker's two favorite modern country vocalists are Vince Gill and George Strait. Parker's work at KVOO is what he considers to have won his major awards, including the Country Music Association award, four Academy of Country Music Awards and the Oklahoma Association of Broadcasters' Lifetime Achievement Award. Parker also landed in the Country Music Disc Jockey Hall of Fame and the Western Swing Hall of Fame. In 1972, Parker finally did make Broken Arrow his home. "I felt like Broken Arrow was the kindest, neatest place to be and to live," he said. "It was much smaller in 1972. "I just, more or less, moved in on Broken Arrow and Broken Arrow moved in on me." Broken Arrow even got a Hee-Haw salute when Parker appeared on the show one year. Parker has served and performed at several Broken Arrow functions, such as Rooster Days. Parker's last big Broken Arrow gig was to announce the winner of the Buy Broken Arrow campaign Dec.19 at the North Intermediate High School stadium. Parker does the spots for his Broken Arrow buddies, all for free. "I do it because I love Broken Arrow and I love the people of Broken Arrow," he said. Parker has a Bob Wills tribute album out called "Swingin' with Bob," and a gospel album, both of which are available at Roy and Candy's Music, 9909 E. 61st St., and Frontier Music and Tapes, 3130 S. Winston.